Should Your Elderly Parents Live at Home Alone? Elderly parents want to remain living independently, but it can be a struggle as they decline in physical or mental abilities. But when they are determined to do so, what do you do? AARP reported earlier this year that 80 to 90 percent of aging people, including our elderly parents, would choose to reside in their own homes for as long as possible, as opposed to choosing to live in a nursing home or independent care facility. This desire by your elderly parents to live independently can make it challenging for the adult child/children who is caring for them. . Many adult children also prefer that their elderly parents or loved ones stay in their own home so that they maintain their independence and active lifestyle. However, this situation can often become very stressful for the family because leaving an aging parent home alone can create additional worry. What if they slip and fall with no one around to help? What if they are unable to follow hospital discharge regimens or daily routines on their own? Home Preparedness: If your elderly parents are going to remain in their home, you should work with them to ensure the home is safe by removing potential hazards both indoors and out. Remove trip hazards like throw rugs, clutter, light cords and other items on the floor. Install handrails in the shower or bathtub to avoid any falls. Add adequate outdoor lighting and handrails around the outside of the home as well. Check our August 2016 blog post: “Essential Safety Tips for Seniors Living Alone” for additional home improvements to help seniors remain safe at home. Health Care Plan: Many older adults take medications daily. Develop a plan to ensure they are following the directions of their doctor. Start by making a list of the medicines the doctor has prescribed, as well as any over-the-counter products (vitamins and herbal supplements) they are taking. Go to your parent’s next doctor’s appointment to better understand their medical needs, and work with the doctor and/or pharmacist to understand dosage amount and daily schedule. Find the right pillbox or dispenser that would work best for them. There are basic day-of-the-week cups to four-times-a-day expanded versions. There are also electronic versions and even talking pillboxes that can be helpful for family members with vision loss. Healthy Meal Preparation: Eating properly each day is essential for physical and emotional well-being. 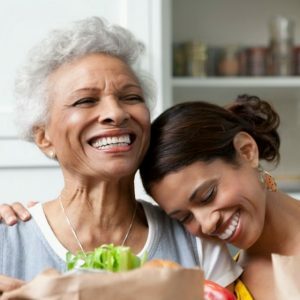 If your elderly parents are unable or don’t want the stress of driving themselves to the store to grocery shop, they need a support system in place. Solutions like Meals on Wheels, where volunteers deliver meals to home-bound family members, or online grocery shopping with local home delivery, are options. FirstLight Home Care provides Companion Care services where our caregivers work with your aging parents to determine the grocery list and help them with their grocery shopping. They can also help with meal preparation and other personal assistance. Emotional Needs: It is important for your elderly parents to have connections and activities outside of the home. Maintaining engagement within the community can support an elderly person’s feeling of connection with the world beyond his/her family. It is important that they don’t spend every day alone. FirstLight Home Care can provide in-home visits or help them get to doctor appointments, errands, or lunch with friends. Caring for an aging parent who is living independently can be challenging if you cannot be there 24/7. FirstLight Home Care can help them enjoy the best quality of life and maintain independence for as long as possible. Our caregiver role in their life will support them and keep you informed so you’ll have peace-of-mind that he or she is being cared for in the loving way you would care for them yourself. Have other questions about our home care services? We’re here to provide you with the support and advice you need. Just Ask FirstLight.